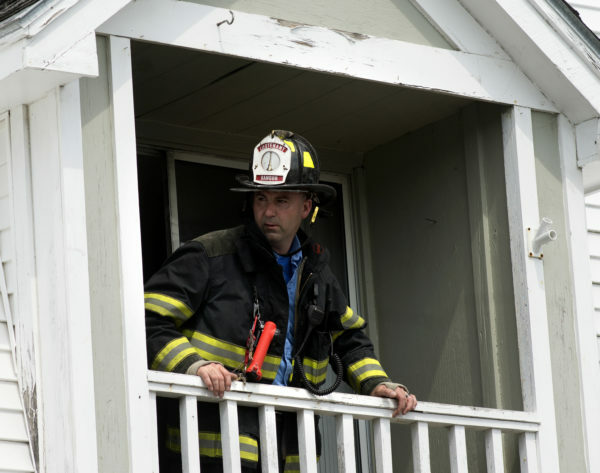 Lt. Andrew Emery, Bangor Fire Department, looks out from the balcony of an apartment in a multi-facility building on Walter Street in Bangor that had a kitchen fire Thursday morning. 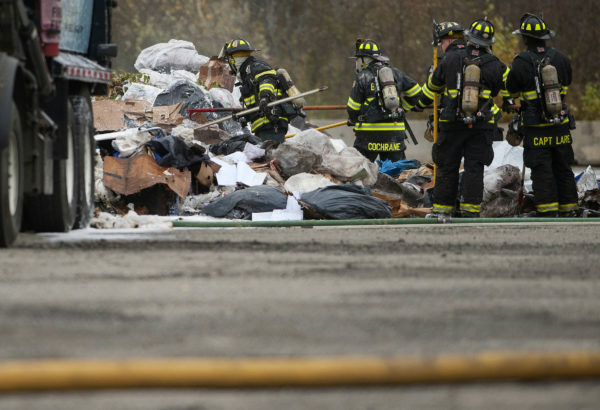 Bangor Fire Department work to extinguish a trash fire that started in a trash truck on Bennett Street in Bangor Friday. The driver of the truck noticed smoke and quickly dumped his load into the parking lot. Bangor officials want to eliminate four firefighter positions previously funded through a federal grant, a move union leaders claim could leave the fire department inadequately staffed when responding to calls. Keeping the positions without the grant would be too costly, and firefighters can fully respond to fires and emergency calls without them, city officials said. The positions gave the fire crews “the cushion of additional folks” when responding to a call and aren’t necessary to respond to an emergency, City Manager Cathy Conlow said. But firefighter union leaders are pointing to a 2013 federal grant application in which Fire Chief Tom Higgins, then assistant chief, wrote that the department would be “inadequately staffed” when responding to emergencies without the positions. The department today responds to more than 10,000 calls per year — the vast majority being medical emergencies — a number that has grown over the past decade from about 7,500 per year, said John York, president of the union Bangor Professional Firefighters. If anything, the city needs more firefighters in the time since Higgins filed the grant application, York said. Losing those positions would reduce the number of firefighters from 22 to 21, including assistant chiefs, working on each of the department’s four shifts, York said. He later clarified that he believes the staffing levels are actually adequate but tried to use strong language on the application and portray the situation in a way that would allow the department to receive the grant. The union earlier this month opened negotiations with the city over the staffing cuts through a state law called obligation to bargain. For nearly three decades, Bangor has budgeted for 88 firefighter positions — four of which were funded through a two-year $500,000 Federal Emergency Management Agency grant that expired on May 1, according to York. If the city were to pay for those positions, which became vacant following recent retirements and people leaving the force, it would cost $250,000 the first year, plus additional training and equipment expenses and add 10 cents per $1,000 of taxable value to the mill rate, said Higgins. The positions could be retained if the city is able to secure future FEMA Staffing for Adequate Fire and Emergency Response grant funding, City Council Chairman Joe Baldacci said. But the grant application process will not reopen until the fall and awards will not be announced until later in 2018, York said. The department has periodically operated with fewer than 88 firefighters on staff for periods as staff have retired or left the force. But those positions have always been filled in later years, either through the city or the federal SAFER grant. When operating with 84 firefighters instead of 88, the department was only hitting National Fire Protection Association standards of having an adequate number of fire officials responding to a call without using overtime 20 to 39 percent of the time, Higgins wrote in the application. At 88 firefighters it would hit those standards 80 to 99 percent of the time — allowing it to respond to emergencies more effectively, reduce response times and allow for an “appropriate number” of trained personnel to assemble at the scene of an incident, Higgins wrote in the 2013 grant application. Higgins on Friday said those numbers were best practice standards and not mandates and believes the department has the ability to adequately respond to calls and surpasses the staffing levels of other area departments. “We’ve worked hard to keep the [staffing] numbers up through the grant process and I suspect we will work hard to get the grants in the future,” Higgins said.